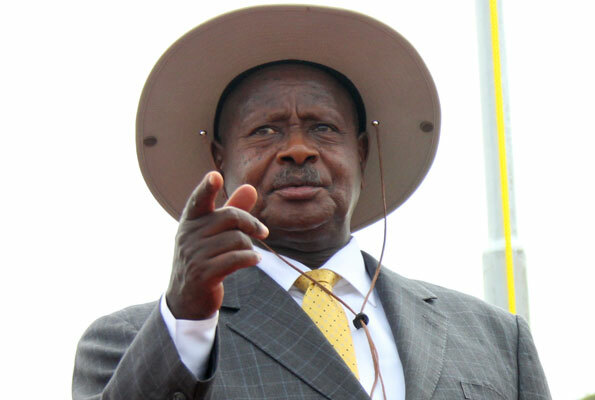 WHY DID MUSEVENI DECLINE TO SIGN THE GMO BILL? So what could have happened to the apostle of GMO on the road to Damascus? It was not a sudden light from heaven that shone around the president for sure, nor was it anyone from anti-GMO confusing him as pro-GMO agents would like us to believe. The president took time to analyze the GMO bill and then provided sound reasons stated clearly, item by item, as to why he rejected signing the GMO bill. He has done his home work, he knows those promoting GMOs haven’t told the whole story. In August, 2003, as president Museveni presided over the launch of a biotech lab at the Kawanda Research Institute, he told the audience that George Bush, the US president, had urged him to take on GMOs during his visit. 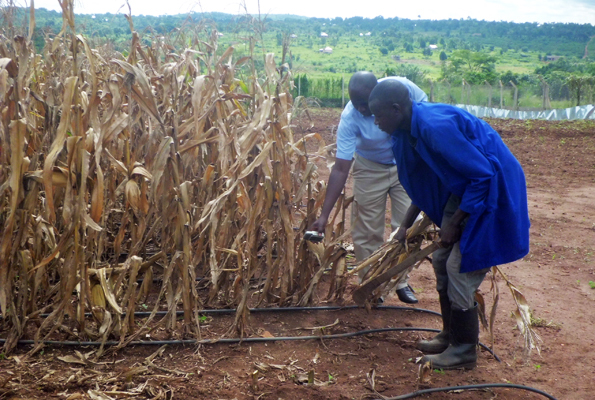 He got applauses from the staff of the National Agricultural Research Organisation (NARO). But he warned against abuse of biotechnology, saying the Government was against GMOs becoming a problem. It is the very same message he is now sending out. Except this time, NARO’s stuff is not ready to hear that warning. Item #2. The president is wondering and asking whether irrigation of WEMA is a hoax. The evidence is right here Mr. president in the picture, as the saying goes, a picture is worth 1,000 words. Black tubes on the ground are drip irrigation system that drips water at the roots of the plant. As I listened to Prof. Latigo’s frustration, I can understand why he would rather talk of genes in monkeys and humans, instead of item #10, which deals with “Accountability.” Since Prof. Latigo believes in the safety of GMOs, then it shouldn’t be an issue going along with the president’s demand to hold GMO developers accountable when their innovation creates a problem. As Prof. Latigo goes into details of how Uganda has some of the best Scientists with NARO, he forgets that the president knows about Dr. Pusztai who was awarded a $3 million grant by the UK government to design the system for safety-testing genetically modified organisms (GMOs), in late 1990s. And then what happened to him after his team of highly qualified scientists he headed found out troubling facts about GMO biotechnology! Here we are talking of Rowett Institute in Aberdeen, is it any wonder that the UK Houses of Parliament ordered GMO food off their menu!, could it be by coincidence or something to do with Dr. Pusztai’s research findings and warning! The Agonas and Latigos want to convince the public that the president declined to sign the GMO bill because of his ignorance about Biotechnology, yet we have equally if not more qualified specialists on Genetically Modified Organisms/seeds (GMOs) like Dr Daniel Maingi in the same boat with the president. Monsanto’s GMO agr. biotechnology destroyed pollinators and wiped out 90% of monarch butterflies within just 20 years, the US tax payers were left to pay for the damages while Monsanto laughed all the way to the bank. This is the kind that the president doesn’t want to happen to Ugandans. Accountability is making one whole, it has nothing to do with being an expert or even understanding basics of Biotechnology. The president’s position is that Responsibility & Accountability must go hand in hand, to protect the consumer. South African farmers suffered millions of dollars in lost income when 82,000 hectares of genetically-manipulated corn (maize) failed to produce hardly any seeds. 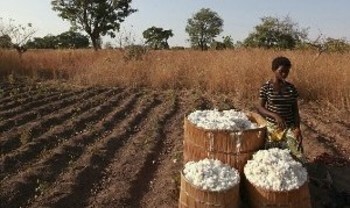 Sudan: The Sudanese Ministry of Agriculture’s acknowledgement of the failure of genetically modified cotton is a late attempt to contain the farmers’ anger about the government’s disastrous policies, according to El Gezira and El Managil Farmers Association. Late last year, President Al Bashir described the Scheme as not feasible and a burden on the country’s budget. Promises of GMO agr. controlling pests, has instead created more vicious ones called Super-bugs , e.g.. new evolved Fall Army-worm type which pesticides on the market can’t kill, is a creation of GMO agriculture. That is the one devastating agriculture across Africa. The same Fall armyworm pest resistant to GM Bt corn in Brazil. GMO proponents are pushing GM Bt corn in Africa as a solution to the fall armyworm pest, which has been rapidly spreading across the continent.But a new study from Brazil shows that this GM technology is already redundant. The president was assured that the solution to Fall armyworm is GMO agriculture, just like South Africa. But he has now found out that all that is a hoax, since South African GMO maize farmers like Jacques Prinsloo are equally devastated, but even worse since they paid high prices for the GMO maize seeds with promises of resistance to pests. GMO agr. Skyrockets agrochemicals use. Studies have shown that, contrary to often-repeated claims that today’s genetically-engineered crops have, and are reducing pesticide use, the spread of glyphosate-resistant weeds in herbicide-resistant weed management systems has brought about substantial increases in the number and volume of herbicides applied. Over 99% of GMO acreage is engineered by chemical companies to tolerate heavy herbicide (glyphosate) use and/or produce insecticide (Bt) in every cell of every plant over the entire growing season. The result is massive selection pressure that has rapidly created pest resistance—the opposite of integrated pest management where judicious use of chemical controls is applied only as necessary. Predictably, just like overuse of antibiotics in confined factory farms has created resistant “supergerms” leading to animals being overdosed with ever more powerful antibiotics, we now have huge swaths of the country infested with “superweeds” and “superbugs” resistant to glyphosate and Bt, meaning more volume of more toxic pesticides are being applied. Ugandans should appreciate the precautionary approach the president is taking, after all, that is what the The Cartagena Protocol on Biosafety demands. And as you can see in examples given above, those are some of the problems the president is concerned about. GMO agr. is risky and involves losses, hence the reason for precaution and accountability. Had the US taken that precautionary approach in 1999 when it was warned as follows: “Monarchs are considered to be a flagship species for conservation. This is a warning bell,” said Rayor, after the research study concluded that pollen from GM corn kill monarch butterflies, the government wouldn’t be talking of monarch butterflies as one of the endangered species. U.S. Fish and Wildlife Service Banned GMOs and Neonicotinoid Insecticides, after a lot of damage had been done, the president is trying to make sure that Uganda don’t repeat the same mistakes of the US.Uganda. Item #3 and #4, are indirectly to protect the national economy. Agriculture is the major contributor to GDP as well as an important source of foreign exchange revenue. Item #3, in addition to protecting our food crops, it also protects cash crops such as Coffee. Contaminated Coffee with GMOs would destroy all the Coffee export, just like what happened to Wheat export in the US when a few GMO Wheat stalks were discovered in some field. But even worse, conflicts over cross contamination can lead to loss of lives. Hence the law must take into account of that possibility ahead of time. Remembering these words, “Instead of letting bananas ripen and go to waste, he peels them and packages them for export.,” it is mind boggling why this will not happen with GMO bananas since they can’t be exported to any Western country. Have the NARO scientists forgotten Iowa State University going Bananas over GMOs? As of item #4, Uganda’s Organic Food agriculture needs to be protected. The future of Foreign Exchange Revenue is in Organic foods , that is where Uganda government should be investing, not in GMOs. In fact there is no such a thing as getting license to export GMO crops to any Western country, except as Animal Feed, and even then, not all of the Western countries do it. Item #7, is to deal with Monsanto’s pro-GMO agents who have expertise in functioning as Spin doctors. The president started off by pointing out this issue when he stated that the naming of the Law was not clear. Why name it “Bio-Safety Law”, when it is “Genetic Engineering?” By not separating the difference between Plant from Animal genetic engineering, we then get Prof. Latigo attacking the president’s rejection of signing the bill as a sign of being ill informed because as he puts it, Uganda has already used and benefited from Biotechnology such as in Vaccines and HIV/AIDS drugs. We see these pro-Monsanto spin doctors exposed all the time, but they keep coming, telling us that Glyphosate is a general purpose insecticide that is basically less poisonous to man than a strong drink of caffeine of coffee! EU has rejected renewing Roundup/Glyphosate for usual 15 year term, and agreed to only maximum of 5 years before banning it. France plans to ban it within 3 years. 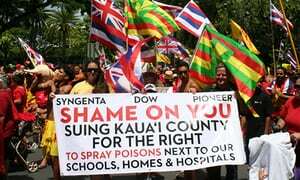 In the US – More than 295 lawsuits are pending against Monsanto Co. in U.S. District Court in San Francisco, filed by people alleging that exposure to Roundup herbicide caused them or their loved ones to develop non-Hodgkin lymphoma, and that Monsanto covered up the risks. GMO agriculture very heavily depends on Glyphosate/Roundup and other toxic agrochemicals, check out Hawaii, GMO experimental ground zero. The president has demonstrated to the Monsanto’s Agents his ability of understanding the Precautionary principle per the Cartagena Protocol on Biosafety, way better than they had anticipated just because he supports GMO biotechnology.